— The Gabel&Co. listen to the pulse of the times and on the palate of the people. The successful restaurateur Vladan Rado Radovanovic combines valuable Viennese cuisine with the finest hand-made Mediterranean pasta specialties to a comprehensive and delicious taste experience. 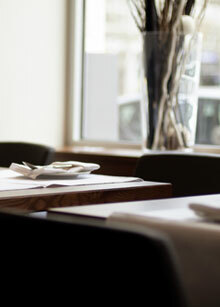 — Enjoy a quick or full breakfast and a selection of different lunch menus. In the evening you dine in peace Ã la carte. A fine selection of Austrian and Italian wines finally provides for a full-bodied and often late finish.